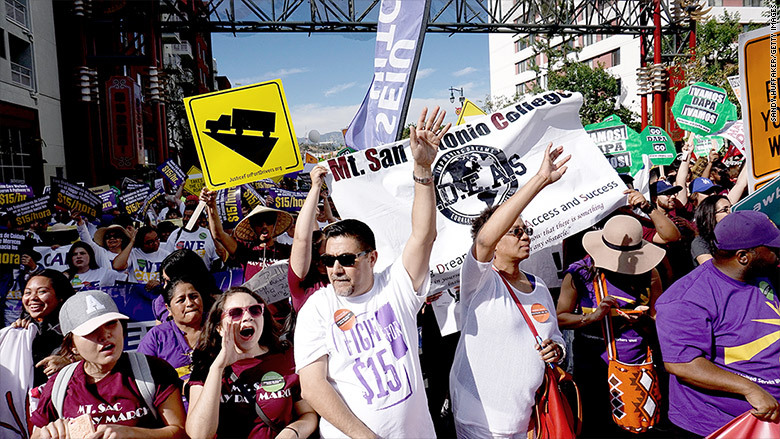 The nation's second largest city is the latest to join the movement to hike the minimum wage to $15 an hour. The Los Angeles City Council vote on Tuesday would phase in the increase to $15 by 2020. An earlier proposal that would have raised the minimum to $15.25 by 2019 would have benefited 40% of L.A.'s workforce, according to the National Employment Law Project. Tuesday's vote directs the L.A. city attorney to formally draft legislation that will then go before the same council for a vote. Mayor Eric Garcetti has been pushing for a hike and said he looks forward to signing the bill. "Today, help is on the way for the one million Angelenos who live in poverty," he said. The legislation will give small businesses with fewer than 26 employees an extra year to phase in the wage hike. The small Washington town of SeaTac was the first municipality to institute a floor of $15 an hour, and it was followed by Seattle and San Francisco. New York City Mayor Bill de Blasio has also come out for raising that city's wage to $15. The federal minimum wage is $7.25 an hour, but the Obama administration has been pushing Congress to raise it. Big companies are also hiking what workers make. Facebook (FB) said last week it will require its U.S. contractors and vendors to pay their employees at least $15 an hour and to offer paid time off for sick days and vacation. Walmart (WMT) also gave its lowest-paid workers a raise, pledging to give all of its employees $10 an hour by February 2016. TJX Companies (TJX), which owns T.J. Maxx, Marshall's and Home Goods, will hike employee wages to at least $10 an hour sometime next year as well.